If you don’t get these already you don’t know what you’re missin‘! I love getting these in the mail. It’s a free subscription from Kraft. Its called Food & Family. 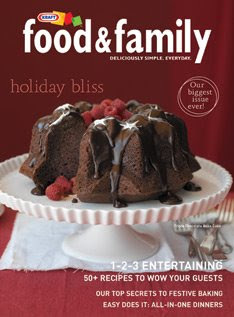 It has so many GREAT recipes in every issue. They usually include some good coupons in there as well! You can view past books here and sign up for it here. I also love their regular website here. I love that they send me emails with new recipes often and that I can store them in my own personal recipe box. I have also printed them out. I have told myself one of these days I am going to scrapbook together a cookbook! ***This magazine is no longer free but still WELL worth the requested subscription price. LOVE this magazine!!!! Someone told me about it a few years ago and I always find wonderful, easy recipes in it! I get this too, and LOVE it!